This is a very helpful course. It helps me better understand BCM prcodure and how to desgin and execute business continuty testing. Topics were well covered and ideas were well discussed during the course. Thank you for conducting a very well organised session! 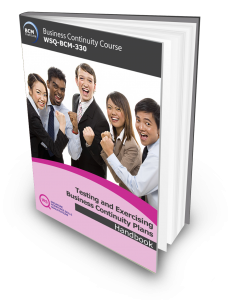 The last of a three-part competency-based Skillsfuture Singapore (SSG), Workforce Skills Qualification (WSQ) training series teaches participants the skills of testing and exercising business continuity plans. document formal exercise and testing for management review. will be able to achieve the international recognised Business Continuity Certified Specialist (BCCS) certification once they passed the Qualifying BCCS exams.